Manage your 3D printing from one place on your desktop, for maximum uptime. Schedule multiple print jobs to multiple 3D printers, monitor print progress and keep track of maintenance – all you need is one or more Ultimaker 3 and Ultimaker Cura software. Check if you have the latest firmware and Ultimaker Cura software, then connect one or more Ultimaker 3 3D printers to create a group. You can add more printers as you need. Start your print and Cura Connect finds the right 3D printer, or prompts you if you need to set one up. Queue multiple jobs and track progress as they print. Get the best performance from your 3D printers. No more wasted time starting each print, plus schedule maintenance tasks to keep your machines in top condition. 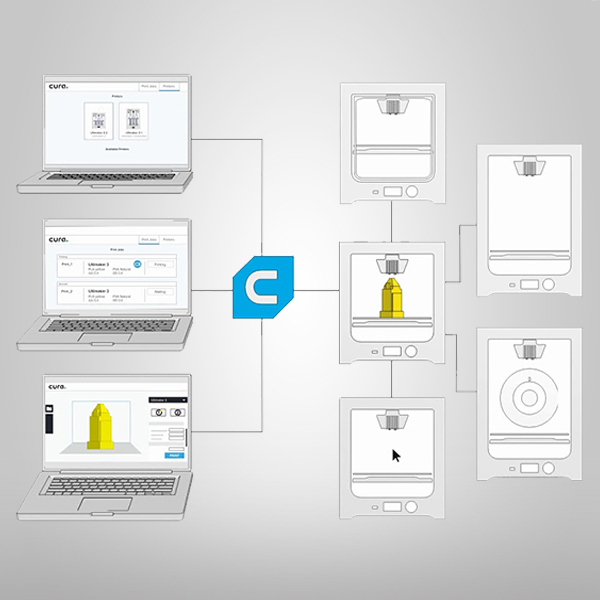 With Cura Connect and the Ultimaker 3 you can scale your 3D printing operations – from managing a single machine to a whole studio of 3D printers. Give your business the edge with Ultimaker software, hardware, and materials, helping you maximize speed, efficiency, and productivity.